When invited to preview Magic cards for new sets, authors must sometimes feel pressure to stoke enthusiasm and demonstrate exaggerated excitement for their subject, especially for flavorful cards that, sadly, have little chance of Top 8ing a Pro Tour or making a splash in tournament play. Although we would be honored to unveil any new card to Magicdom, we are fortunate that our subject requires no hype whatsoever. We confidently predict that this card will not only become a staple in the Eternal format diet, but a broadly playable spell (to an almost comic degree) in the grandest of all formats, Vintage. This is a card that will be played for years, if not decades, to come. Although aptly named to represent a critical part of the story in Aether Revolt, resolving this creature in Vintage will inspire more despair and fear than hope. 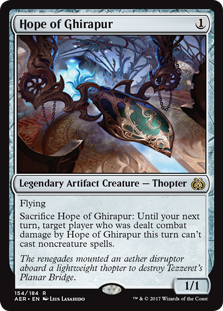 Although most obviously comparable to Xantid Swarm, a creature that, when triggered, prevents the opponent from countering any threat you may subsequently cast, Hope of Ghirapur is so much more powerful than those green insects. Unlike Xantid Swarm, which only “shuts off” the opponent on your turn, this Legendary Thopter prevents your opponent from casting any non-creature spells on their turn as well. When used with recursion such as Auriok Salvagers or Goblin Welder, this may be the closest thing in Vintage to a one-mana Mindslaver or Scepter-Chant lock. The only window of opportunity for the opponent to disrupt it is between your upkeep and combat step. And, when tutored with cards like Trinket Mage, or more creatively, Artificer’s Intuition, this is a threat that can be reliably iterated even before it can be recurred. In this episode, Kevin and I carefully explore the design spaces opened in Vintage by this wondrous little marvel, and identify applications both mainstream and speculative. Welcome to Vintage little thopter. Let the fun begin!